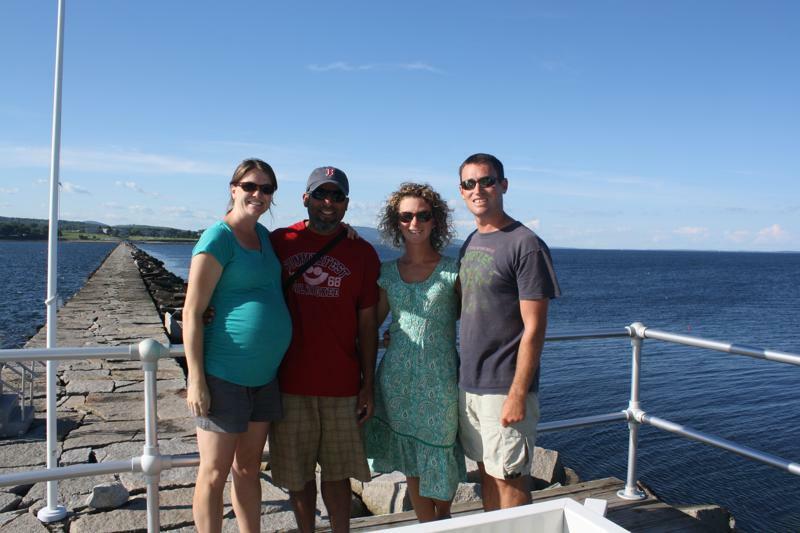 On the last day of Sunny and Berkley’s visit we took in the sights of downtown Rockland. Brian and I met our friends that morning at the Brass Compass Cafe where Sunny had just chowed down on the cafe’s famous lobster club. Yup, he had leftovers. The Brass Compass Cafe made their claim to fame when proprietor/chef, Lynn Archer’s lobster club won during a throw down competition against Food Network’s chef, Bobby Flay. Good home cookin’ can never be outdone! It was a warm, sunny day in Rockland and Brian and I were reminded that it is actually August while we browsed in and out of the town’s shops and galleries. We began our tourist tour with a visit to the Puffin Project Visitor Center. Then, we took Sunny and Berkley into some of our favorite shops; Farnsworth Museum gift-shop, the Island Institute’s Archipelago (gallery & store filled with talents of Maine island dwellers), and the Grasshopper Shop. Of course Sunny and Brian took a detour once we’d arrived at the Grasshopper Shop and they instead arrived at Hamilton Marine. We stopped at the Thorndike Creamery for a pick-me-up pizza slice; this cafe serves up Gifford’s ice cream as well as sandwiches and pizza, a fabulous combo if you ask me! 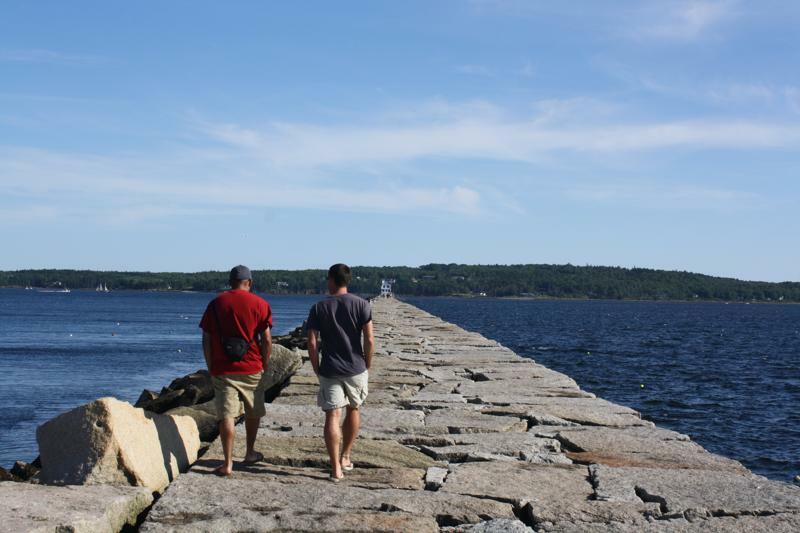 We took a break from town with a stroll down the Rockland Breakwater for a closer look at the lighthouse. This breakwater is 7/8-mile long. The lighthouse at it’s end was built in 1902; it is now owned by the city of Rockland and managed by the American Lighthouse Foundation’s branch Friends of Rockland Harbor Lights. The lighthouse was automated in 1965. It is currently undergoing renovations. What better way to end the day then for the best burger downtown at L&H Burgers. Our burgers and sandwiches were delectable…can’t say the same for the service but I’m sure it will improve in no time! Good times. I know there will be many, many more to come! 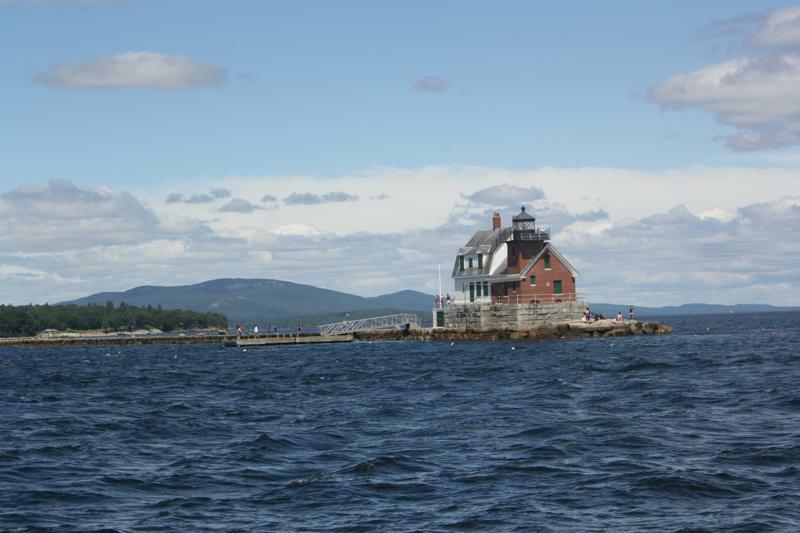 This entry was posted in Uncategorized and tagged Farnsworth museum, grasshopper shop, L & H Burgers, rockland breakwater lighthouse, rockland lighthouse by stephanie. Bookmark the permalink.